While over three years have passed since the self-immolation of the Tunisian street vendor Mohamed Bouazizi, which marked the beginning of the so-called Arab Spring, the outpour of literature on the subject continues at a rapid rate. New books across a multitude of disciplines continue trying to document and analyze the cataclysmic events that are reshaping the Middle East: from historical overviews on resistance movements to photographic volumes on Tahrir Square. One of the latest additions to this eclectic and ever-expanding genre is Carnegie scholar Marwan Muasher’s The Second Arab Awakening and the Battle for Pluralism. Unlike many of its counterparts, this book does not treat the Arab Spring as a “soundbite, oxymoron, spectacle, a screen on which to project abstracted hopes and fears,” to borrow a phrase from Maria Golia. Instead, Muasher offers a concise and practical treatise from the perspective of a policymaker-turned-scholar, which puts the events in their important historical—and regional—context while making critical recommendations for enhanced state-society relations in the Middle East. The early chapters offer a sound diagnosis of the Arab transitions: while Egypt undergoes a “convoluted process,” the situation in Tunisia is more positively described as an “inclusive transition.” In Syria, we are witnessing an “existential struggle,” while Bahrain is living on “borrowed time.” For Muasher’s native Jordan, where he previously served as foreign minister, the situation is referred to as a “squandered chance,”—in other words, Jordan could have served as a model for a true second Arab Awakening given that the country has all the elements to be a paradigm for political and religious tolerance, but it has not taken the adequate steps on the political front. Though Muasher presents each of these cases as different sorts of models, they are not mutually exclusive and treating them as such would deny the important diffusion phenomenon that is ever apparent. These uprisings are undeniably intertwined processes: one country’s mistake is often another country’s lesson learned. For example, the softening of Tunisian Islamists in late 2013 was likely influenced by the unexpected events that ousted the Muslim Brotherhood in Egypt in June and July 2013. It is the second part of the title—and the latter half of the book—which touches on an important concept that has also become a buzzword: pluralism. Muasher’s premise is that, if any factor has contributed most to the years of stagnation in Arab society, it is the near total absence of diversity and pluralism from political and cultural discourse. Part of his rationale for the uprisings is that they were a rebellion against so-called absolute truths, a desire to break away from the “single person, party or ideology as the holder of all answers to all problems.” He therefore calls for constructing adequate mechanisms for pluralism as the only viable means forward for societies that are—and have always been—culturally, ethnically, and religiously diverse. Muasher’s definition of pluralism is multifaceted. On the most basic level it is a “fundamental commitment to political diversity at all times,” later defined as “everyone’s right to peaceful political participation and no one’s right to monopolize truth or power.” In more specific terms, it means a system of checks and balances that redistribute power away from the executive and toward the legislative and judicial branches of government, and a system of protective constitutional mechanisms (which, in his analysis, Tunisia has come closest to). It’s worth noting that a pluralistic society for Muasher is one that includes Islamists too: demystifying the Islamist threat, he argues in a thorough section on political Islam, means getting one step closer to pluralism. While this suggestion is absolutely crucial, it is worth noting that this subtle change is already taking shape to some degree and should be one of the sources of optimism. As early as March 2011, during the referendum in Egypt—the first real political process following the overthrow of Mubarak—men and women in Cairo’s streets, from all walks of life, were engaged in deep conversations about the ramifications of this political process in which they were proudly participating. Words like “referendum” and “constitutional amendment” were slowly making their way into the daily lexicon, and that is no small feat. 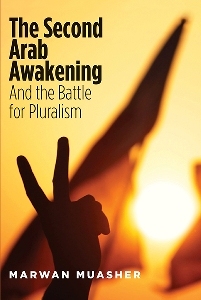 Nonetheless, three years into the Arab uprisings, the crisis of pluralism is one that has barely been addressed: neither Islamist nor secular forces in the Arab world have demonstrated a solid commitment to pluralistic and democratic norms. Both have accused the other of exclusionist practices while employing the same type of exclusionist discourse themselves, and, as Muasher puts it, as long as we’re in the this zero-sum game, the sum will be zero. Omar El Okdah is a policy analyst in the Middle East program at the International Peace Institute. Omar El Okdah is a Senior Policy Analyst at the International Peace Institute.